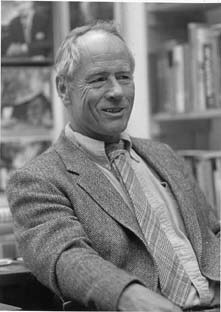 Historian Stephen E. Ambrose has written numerous books about American history, including the Lewis and Clark expedition, the transcontinental railroad, and the Civil War, but he is perhaps best known for his histories about World War II, particularly D-Day, June 6, 1944: The Climactic Battle of World War II and Citizen Soldiers: The U.S. Army from the Normandy Beaches to the Bulge to the Surrender of Germany. Born January 10, 1936, in Decatur, Illinois, Ambrose grew up in Whitewater, Wisconsin. He earned a B.A. in history at the University of Wisconsin in 1957. After earning his M.A. at Louisiana State University, he returned to Wisconsin to earn a Ph.D. in 1963. Over the course of his career, he taught history at a number of universities and published more than 20 books. He also was a director emeritus of the Eisenhower Center in New Orleans and founded the National D-Day Museum in New Orleans. He died October 13, 2002, in Bay St. Louis, Mississippi, from lung cancer. He was 66 years old. Halleck: Lincoln’s Chief of Staff. Baton Rouge: Louisiana State University Press, 1962. Upton and the Army. Baton Rouge: Louisiana State University Press, 1964. Duty, Honor, and Country: A History of West Point. Baltimore: Johns Hopkins Press, 1966. Eisenhower and Berlin, 1945: The Decision to Halt at the Elbe. New York: Norton, 1967. The Supreme Commander: The War Years of General Dwight D. Eisenhower. Garden City, NY: Doubleday, 1970. Rise to Globalism: American Foreign Policy since 1938. New York: Penguin, 1971. General Ike: Abeline to Berlin. (juvenile) New York: Harper & Row, 1973. Crazy Horse and Custer: The Parallel Lives of Two American Warriors. Illustrations by Kenneth Francis Dewey. Garden City, NY: Doubleday, 1975. (With Richard H. Immerman) Ikes Spies: Eisenhower and the Espionage Establishment. Garden City, NY: Doubleday, 1981. (With Immerman) Milton S. Eisenhower: Educational Statesman. Baltimore: Johns Hopkins University Press, 1983. Eisenhower: Soldier, General of the Army, President-elect, 1890-1952. New York: Simon & Schuster, 1983. Eisenhower: The President. New York: Simon & Schuster, 1984.
Pegasus Bridge: 6 June, 1944. London: Allen & Unwin, 1984; New York: Simon & Schuster, 1985. Nixon: The Education of a Politician, 1913-1962. New York: Simon & Schuster, 1987. Nixon: The Triumph of a Politician, 1962-1972. New York: Simon & Schuster, 1989. Eisenhower: Soldier and President. (condensed version of Eisenhower: Soldier and President). New York: Simon & Schuster, 1990. Nixon: The Ruin and Recovery of a Politician, 1973-1990. New York: Simon & Schuster, 1991. Band of Brothers: E Company, 506th Regiment, 101st Airborne, from Normandy to Hitler’s Eagle’s Nest. New York: Simon & Schuster, 1992. D-Day, June 6, 1944: The Climactic Battle of World War II. New York: Simon & Schuster, 1994. Undaunted Courage: Meriwether Lewis, Thomas Jefferson, and the Opening of the American West. New York: Simon & Schuster, 1996. Americans at War. (essays). Edited by Stephen E. Ambrose. Jackson: University Press of Mississippi, 1997. Citizen Soldiers: The U.S. Army from the Normandy Beaches to the Bulge to the Surrender of Germany. New York: Simon & Schuster, 1997. The Victors: Eisenhower and His BoysThe Men of World War II. New York: Simon & Schuster, 1998. Lewis & Clark: Voyage of Discovery. Photographs by Sam Abell. Washington, D.C.: National Geographic Society, 1998. Comrades, Brothers, Fathers, Heroes, Brothers, Sons, Pals. Illustrated by Jon Friedman. New York: Simon & Schuster, 1999. Witness to America: An Illustrated Documentary History of the United States from the Revolution to Today. Edited by Stephen E. Ambrose and Douglas Brinkley. New York: Harper, 1999. Nothing Like It in the World: The Men Who Built the Transcontinental Railroad, 1863-1869. New York: Simon & Schuster, 2000. The Good Fight: How World War II Was Won. Juvenile nonfiction. New York: Atheneum: 2001. Wild Blue: The B24s Over Germany, 1944-45. New York: Simon & Schuster, 2001. To America: Personal Reflections of an Historian. New York: Simon & Schuster, 2002. Band of Brothers. Dirs. David Frankel, Tom Hanks, et al. HBO Films, 2001. The writer’s official web site, www.stevenambrose.com, includes information about his life and books and links to other sites with information about Ambroses work. This page has been accessed 8405 times. About this page counter. Last Revised on Monday, November 9, 2015, at 04:34:57 PM CST . Copyright © 2001, 2015 The University of Mississippi English Department.